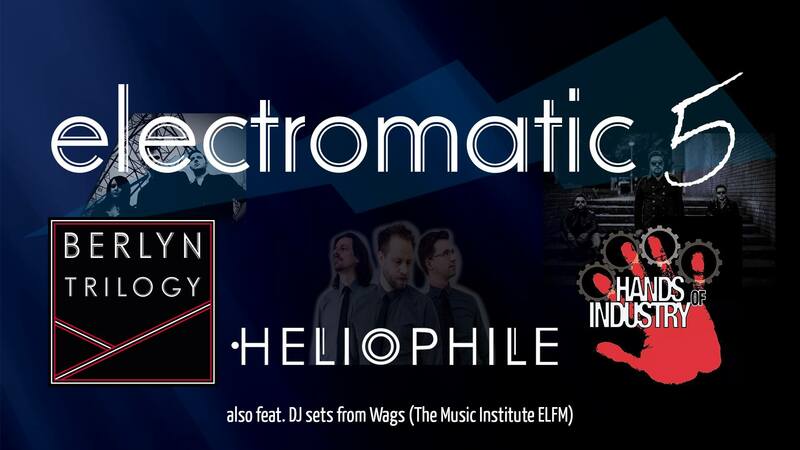 Heliophile are from The Netherlands and we're delighted to have them for their first UK gig! From a background of heavy metal, to superbly designed synthpop. This is not to be missed! Hands of industry hail from Leeds. Driving acoustic drums, catchy synth hooks and samples that provide an imposing and atmospheric backdrop to the dark vocals and lyrical content. Berlyn Trilogy are Wakefield's own synthpop band. "...one of the finest synthpop outfits of the modern era", they bring emotive vocals, pounding beats, synthesisers, and a bass guitar. This outing features James, Faye, and guest vocalist Juls. We'll also be having DJ sets from Wags (The Music Institute ELFM) to ensure your night is complete.